Phragmites australis (pronounced frag-MY-teez) is a non-native, invasive plant which has infested the Lake Michigan shoreline in Delta County in many places, replacing the native vegetation that native insects and animals depend on for food and habitat. Help us protect our beautiful, Lake Michigan shoreline! Working in collaboration with the DNR's Michigan Invasive Species Grant Program, the Delta Conservation District helped to educate Delta County landowners about non-native Phragmites and conduct management treatments between 2014 and 2017. 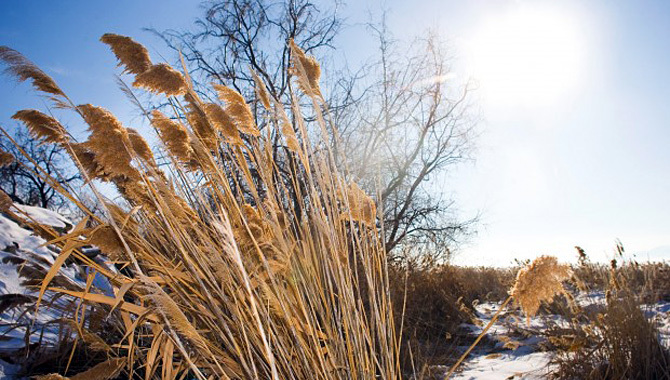 The grant funds may be depleted, but it does not mean the Phragmites problem has been eradicated. The Delta Conservation District is counting on our neighbors to form early detection, rapid response teams to help monitor the Lake Michigan shoreline. Bay Watch members will be asked to keep a trained eye on the beaches and report the new growth and development of the threatening non-native, phragmites invading Delta County. If you are interested in joining our team, please let us know!